It's late 1944 and a flight of Beaufighters take off from their airfield in south-east England to attack German shipping in the North Sea. The late afternoon sky is full of brooding storm clouds and this will probably be the last sortie of the day - and probably not the first. 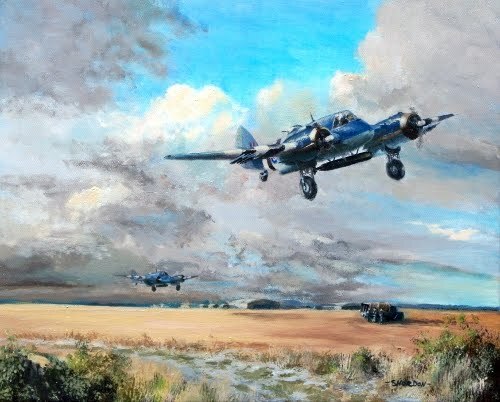 This is a companion piece to Beaufighter Attack and Beaufighter Patrol and shows this outstandingly effective aeroplane from a different perspective. Together the three paintings detail the three stages of a typical patrol - the take off, the journey, the attack. At some point I will add a fourth - the journey home.